The history of pro hockey in the blue-collar Western Connecticut city on Danbury reads much like the history of minor league hockey as a whole across the U.S. There have been highs, lows, monumental achievements and infamous events, and Danbury Arena has been the home to all the memorable times since pro hockey came to town in 2004. 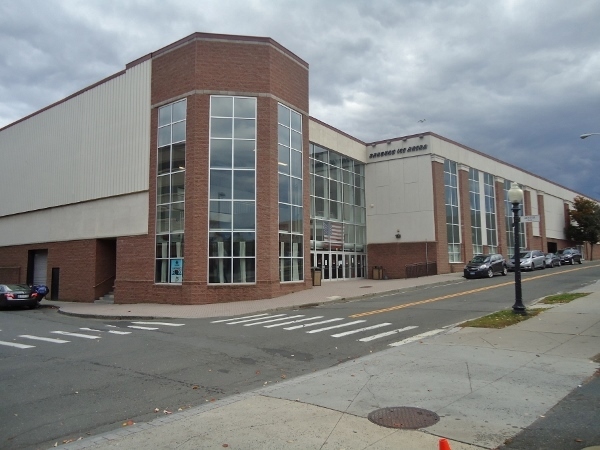 Danbury Arena is better known by its original name of Danbury Ice Arena (the name which still appears in block letters on the buildings facade), and opened in 1999 as a community arena. Locals still call the place "the DIA". A series of rather unlikely events found the arena being renovated in 2004, and additional seating shoe-horned in to accommodate the UHL's Danbury Trashers. Google the phrase "Danbury Trashers Sports Illustrated" and you can get a glimpse into the madness, and fun, that took place here for a couple years during that era. 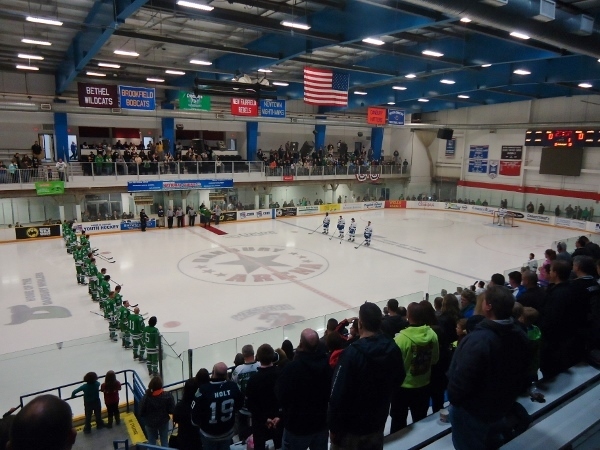 Hockey is going strong in Danbury, despite turnover in franchises from the Trashers to the undefeated New England Stars (look that one up), to the Mad Hatters, to the current tenant the Whalers. Danbury Arena is a modern looking, yet basic, facility with a brick, concrete, and metal exterior and a main entrance which sits on the corner of the building. From the outside it could be mistaken for an office building or a school. A large glassed in entryway greets fans as they arrive, and, although a basic design, the arena appears to fit in to the downtown New England surroundings quite well. The arena clearly is still largely used as a community facility as parents and youth hockey players can be seen lugging their hockey bags back and forth from the adjacent parking garage to one of the two ice pads inside the arena. A simple ticket table is set up inside the main lobby on game day, next to the Penalty Box Bar, which sits in the corner of the arena's lobby. A ticket for the season opener against Watertown cost $16. Although this venue has only hosted pro hockey for about 10 seasons it has become a place that fans talk about when it comes to rowdy crowds and enthusiastic fans. Once past the ticket table you will find yourself on the main concourse. There are food concessions, a Whalers merchandise kiosk, and tables throughout the lobby to sit at. In true community arena fashion there is a skate rental counter as well. To access you seats you either enter into the arena itself if you are seated in the large grandstand, or go up a stairway near the lobby entrance to the balcony section. The large grandstand is on the opposite side from the lobby and is accessed by walking down a rather narrow aisle around the ends of the rink. This grandstand features about 20 rows of metal benches, some with blue plastic seats affixed. The grandstand is rather steep and offers a good view of the ice. Additional seats are squeezed in just about any place there is room for them, including a pair of sections 4 rows high which are seemingly notched into the concrete end wall. The opposite side of the ice (on the same side as the concourse) has balcony type seating which has as many as 7 rows of aluminum bleachers. The 2 middle balcony sections are luxury boxes with chair-type seating. The look of the arena is rather stark, with blue metal beams on the ceiling, and concrete and metal walls. There is a scoreboard mounted to the wall on each end. The benches in the main grandstand offer a good view, and the benches in the balcony are actually too close to the ice, necessitating standing up to get a decent look at the action. Even if you stand you will still be obstructed from seeing play along the near boards as that part of the rink is directly below the balcony. This must also provide a bit of an intimidating atmosphere to opposing players who are taking a faceoff in the corner with fans hanging over the railing 12 feet above them. Many fans choose to watch the game standing along the glass, as fans watch all along the glass on the side below the balcony, as well as along one end of the arena. The DIA clearly has a lot of quirks and, it although comes across as having a bit of a community arena feel to it, has a ton of character and passionate fans who are willing to put up with a bit of an obstructed view or sit on a metal bleacher to watch some hard working players ply their trade. With a listed capacity of 3,000 the place feels quite full with even many less than that as people are jammed in on all sides of the arena to watch the game. The gameday presentation at Danbury Arena comes across as professional, yet very laid back. There was a bit of an opening day mixup as the ticket stated the game would start at 7:30, and most of the fans arrived well before that, however an ACHA college game between Western Connecticut and Army was finishing up, leading to a later entry for fans into the arena and the actual game not starting until 8:15. The Saturday night crowd didn't seem to mind too much. There are a lot of giveaways and promotions during stoppages, and in addition to a chuck-a-puck contest at intermission they had a "whale toss", which actually occurred after the first Whalers goal, where fans threw plastic whales onto the ice to win a prize. There was also a fan shoot out contest and others, and with 20 minute intermissions they stress entertainment between periods here. In another neat tradition, during the media timeout half way through the second period the crowd all stands to sing "God Bless America". They don't seem to be in a hurry to get the game over in Danbury, instead presenting it in a laid back way where the crowd frequently gets involved. The Whalers fans are into the action, often stomping the metal bleachers and providing lots of noise. Despite the fact that the home team trailed 6-1 at one point the crowd stayed into it, although a fair number of fans did leave a bit early. The fans here are rowdy, and Section 102 (I capitalized it because it is almost a proper noun in minor league hockey circles) is well knows as being the most hostile, crudest, and most vocal fans around. They have insulting visiting teams' players and coaches down to a science, and that is all part of the schtick in Danbury, but fans come to expect it, and visiting teams know what they are getting into when they come to town. It may be a bit over-the-top, but Section 102 has earned their reputation as a rowdy and hostile bunch. The Whalers fans didn't have a ton to cheer about as Watertown took a 7-4 win, but a third period rally did bring the fans to life and provided some excitement. The promotional team went out of their way to make opening night an event, even inviting hockey rock band The Zambonis to play at a bar across the street after the game. Having been a fan of a UHL team (the Elmira Jackals) during the era of the Danbury Trashers, the trip to Connecticut was one we had always hoped to make. The spirit of physical intimidating hockey and passionate fans lives on here in the form of the Whalers. Danbury seems to be a place where pro hockey just seems right. With its blue-collar residents and fans who have endured a lot of turmoil, and the fact that the games take place in such a quirky building that is not a palace, but rather a working man's arena, it all seems to just make sense in the sanitized, generic world of modern hockey arenas. Fans in Danbury come to have fun and cheer for the Whalers, and come to bust the chops of opposing players. Win or lose, a visiting team leaves town knowing that the fans were there and that they were in a battle.